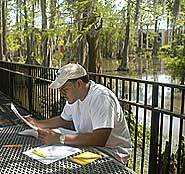 UL Lafayette’s Dupré Library will hold its annual spring Book Sale April 18-21 in the atrium on the first floor of the library. The sale, which will start at 9 a.m. Wednesday - Friday and at 10 a.m. on Saturday, will remain open until 4 p.m. daily. Most of the items in the sale are used books in good condition. Hardcover books will sell for $1 each, and paperbacks will cost 50 cents. Academic titles, fiction, and nonfiction will be available. Everyone is invited to attend the book sale and to purchase books for gifts, for leisure reading, and for research. The library is located at 302 East St. Mary Boulevard. For additional information, contact Sherry T. Broussard, Head of Special Projects, Services and Gifts, at 337-482-6677 or stb@louisiana.edu.